He does have a way of provoking conversation, doesn’t he? Attributed to Banksy in 2005, the original painting belongs to British rock musician Robbie Williams. Let me say this first: I am in favor of the existence of a safe and secure State of Israel. That said, I have a lot of appreciation for Banksy’s Christmas card, even if I don’t agree with every agenda item of If Americans Knew, the organization that is selling the cards this year with this image. 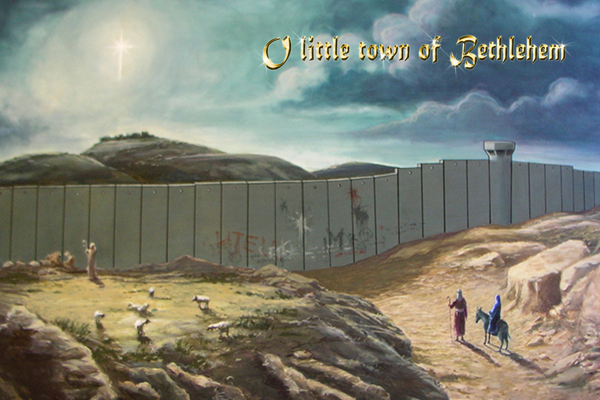 Plenty of comments on blogs that display a reproduction of this picture point out that since Mary and Joseph were Jewish, they would have been free to travel through the checkpoint at the wall. I can understand the resentment of those who object to the artist appropriating the role of Christians’ favorite Jewish family to illustrate the plight of contemporary Palestinians. I invite you to think of this painting from another slant. It reminds us that the story Luke and Matthew tell of Jesus’ birth is not some sentimental fairy tale separated from our world. Jesus was born into a dark and messed up world. He was born as a member of a community divided and oppressed because of race and religion. Bethlehem was not some idyllic utopia of deep and dreamless sleep where all the shepherds were virgins and all the sheep were above average. It was a place under occupation; a place where military power had been used to confiscate the land of people who had owned it for generations. Luke’s account of the Bethlehem birth tells us of an emperor who requires people to travel in order to count them so they can be more efficiently taxed. The taxes will pay for the soldiers who, by the time Luke wrote, had burned the temple to the ground. The Prince of Peace grew up to oppose this occupation through non-violent confrontation, turning the other cheek, walking the extra mile, walking out of court naked (Matthew 5:39-41) Disciples came to recognize the cross as an expression of God’s way of reconciling the world; not through destruction, as in the story of Noah, or through confusion and division, as in the story of the tower of Babel, but through an act of submission. Strength through weakness does not come naturally to human beings. Taking on human flesh in the form of a baby, then refusing to resist the violence of crucifixion–it did not appear to be a winning strategy. Jerusalem fell. The reign of God among us preached by Jesus, where peace and justice reign, seems to have taken a hit. Nations still rage. Violence, terrorism, and brute force remain the weapons of choice by oppressors and liberators alike. It is so easy for me to advocate non-violence. I live in relative safety and security. Would I practice the non-violence of Jesus if somebody threatened my family, my children, my grandchildren? I have to admit to some cognitive dissonance. The question: do you think that non-violent confrontation in the style of Jesus’ sermon on the mount or MLK Jr.’s civil rights campaign, could change things in the Israel/Palestine conflict? Who should adopt it first? Does it matter? Jim Rigby, a thoughtful Presbyterian heretic. What Makes For a Good Public Funeral? What If Jesus Really Meant It When He Said Turn the Other Cheek?